I painted a polyptic of nine canvases in response to the challenge to create “caregiver art”; whatever that meant to me. First, I had to decide what that meant to me! I decided it was an expression of what it felt like to be a caregiver. I considered ivy or vines climbing a tree but I did not wish it to have a negative parasitic sound. Then, my mother sent me to the store to reward myself with some balloons. When I told the florist that I was a caregiver, she was immediately impressed and thanked me. She gave me a rose for free from a vase of roses that they could not sell because they were not perfect. Despite its imperfection, it was still beautiful to behold. I like to paint roses and I began to think about how my husband, though imperfect, was my beautiful rose and that being a caregiver was like taking care of a rose garden. I nourish you with food and medicine and quench your thirst to help you grow stronger and more radiant. I groom you and bathe you so that you are refreshed like the morning dew that sparkles on the roses like diamonds, only you are more precious and more valuable to me. The helping hands of the therapists and doctors like smaller buds surrounding the larger rose offering support and assistance to help reach towards new heights in the sky. Here on earth, the roses fade to make room for new roses, but I will look for you in the rose garden in Heaven where the roses never fade and you will bloom forever. The paralysis of limbs and medicines to thin the life blood make you feel like you are covered with snow and ice. I will warm you with the sunshine of my love even though sweat drips from my brow in the heat of the day. Your spasticity causes your hand to curl up and scratch me like the thorns of the rosebushes, but your beauty is worth the pain. Friends and family visit like the bumblebees buzzing from flower to flower taking pollen and leaving honey. The torrential rain of the thunderstorm of tears relieves and cleanses and renews. Like the friendly ladybugs who feast on those who would sap your strength with doubts and worry; I will protect you forever my beloved rose. 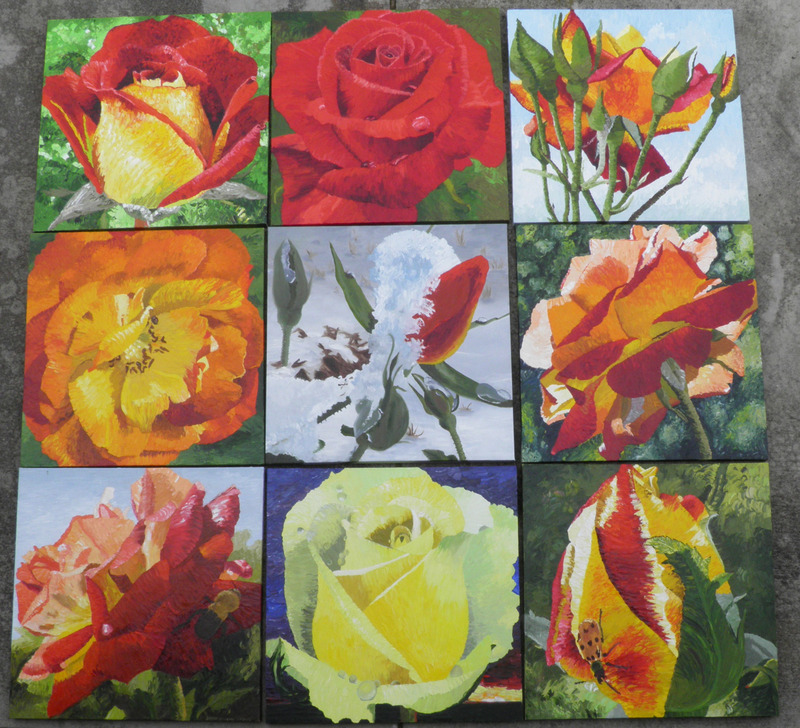 Prints are available of each rose in the Floral Gallery.